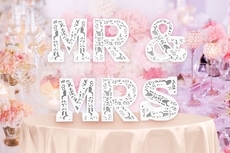 MR & MRS Wooden Letter w/ Build-In Multicolor LED Sign is ideal for wedding decoration, wedding gift, wedding photo props and tabletop decoration. Each Letter approx. The 20-inch height which makes your wedding unique and unforgettable.